Employees are valuable assets. You want to attract, retain and protect the health of top talent. Musculoskeletal injuries are preventable, but cost businesses billions of dollars annually. In 1998, WSIB reported the average cost of a back injury and a carpal tunnel syndrome injury were $33,000 and $15,700 respectively. Choosing a good design for a workstation is no more expensive than selecting a bad design, and it prevents injury. 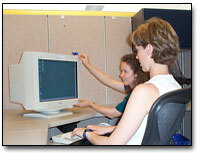 Ergonomics can improve any work environment and it doesn't have to be expensive. By making simple adjustments to equipment or workstation layout and instructing employees on proper work methods, Ergoprime can increase the health, wellness, and morale of your staff while reducing the costs of injuries. when do I need ergonomic services?